The classic story of a man falling in love with a married woman and the two conspiring to kill her husband, The Postman Always Rings Twice inspired two feature films and numerous crime novels. It’s difficult to review The Postman Always Rings Twice without revealing details of the plot. The plot is a familiar one, but the specific elements of this story may not be. Any student of mysteries, whether it be writing, critiquing, or simply reading them, should include this short novel in their must-read list. If you don’t mind some spoilers, than read on. Otherwise, you may want to read this classic before reading the rest of this post. There’s no actual postman in the story. Apparently Cain simply like the title, according to most accounts. However, the “Postman” could allegorically be considered Fate or Death. It’s unclear if Cain thought of this when choosing the title, but this substitution, if you will, works when considering the story. For indeed Fate or Death comes calling for the main characters twice. “They threw me off the hay truck about noon.” So says grifter Frank Chambers beginning his narrative of the events. He’s just twenty-four years-old when he meets Nick Papadakis and his wife, Cora. Nick Papadakis takes an instant liking to the young man and recognizes that Frank is down on his luck during these Depression Era years. Unfortunately, Nick doesn’t notice Frank’s instant attraction to Cora, his wife. Instead, he hires on the young man to perform odd jobs at the Tavern. It’s not long before Frank and Cora have fallen for each other, though it’s more lust than love. Frank learns Cora hates her husband; they often refer to him in the story as “the Greek.” Frank suggests the two of them run away together, but Cora doesn’t want that. “That road, it don’t lead anywhere but to the hash house. The hash house for me, and some job like it for you,” she says. Between them, Frank and Cora concoct a plan to murder her husband. The plan’s a simple one, but it goes disastrously wrong. Fortunately, Nick quite literally doesn’t remember what hit him. A true grifter, Frank ditches town after the failed attempt. He hopes to forget about what happened and forget about Cora. He wins some money, loses it, and ends up right back where he started at the tavern with Nick and Cora. A car trip to Santa Barbara offers Frank and Cora another opportunity to off Nick. This time the plan succeeds, but the district attorney, Sackett, is suspicious. Sackett and the insurance agents—Cora conveniently convinced her husband to take out a policy during Frank’s absence—think the car crash wasn’t so accidental. The plan is starting to unravel. Fortuitously, a defense lawyer, Mr. Katz, decides to take on Frank and Cora’s case. Almost unbelievably—actually quite unbelievably—Mr. Katz gets both Frank and Cora exonerated merely because he doesn’t like Sackett and the two lawyers had made a $100 bet. Frank and Cora are in the clear, but the Postman (Fate or Death) will come calling once more. 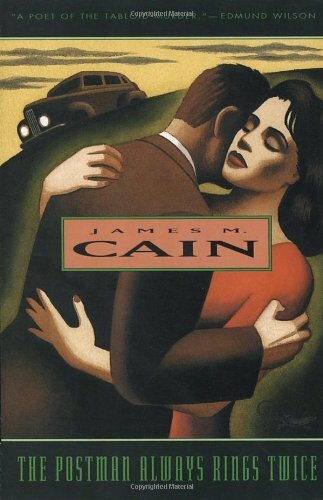 Cain’s short novel (depending on the edition, it’s roughly 100 pages) was famously filmed in 1946 with John Garfield as Frank and Lana Turner as Cora. It was re-made in 1981 with Jack Nicholson and Jessica Lange in the roles. Published in 1934, The Postman Always Rings Twice is often considered the first roman noir, a hardboiled crime novel and the type of book that inspired the film noirs of the 1940s and 50s. Stylistically it’s a dark tale with morally ambiguous characters. Some plot points come across as unrealistic. Frank falling for (or rather lusting for) Cora so quickly and willingly to commit murder for it. Mr. Katz being so cheerfully willing to exonerate two murderers just to win a bet. And I might throw in the almost preternatural insight Mr. Sackett and the insurance agents have into how the murder happened. These elements seem almost fantastic. Yet the story as a whole is a compelling read. The Postman Always Rings Twice has much in common with Cain’s later Double Indemnity and later crime stories. See this post about one such tale. As such, and as I stated before, it is a must read for mystery fans.